1915 Feb was sent home with badly frostbitten feet. 1915 May 12. 5th Battalion, The Welsh Regiment; Parcell Rees Bowen to be Second Lieutenant. 1915 Jul he was commissioned as a Second Lieutenant into the 5th Welsh, and he embarked with the Battalion for Gallipoli, where the Battalion formed part of 159 Brigade, 53rd (Welsh) Division. The Division fought at Gallipoli until the evacuation in December, suffering badly from casualties, forcing the 5th Welsh to merge with the 4th Welsh for a short period. 1915 Aug 10 - One Company detailed to take equipment up to front line. Moved forward 4.45 am. Advanced across Salt Lake under heavy shrapnel and rifle fire. Passed through entrenching battalions of 159th Brigade 11.30am. Official History of the Great War records that the 1/5 was gallantly led by Lieutenant-Colonel B. E. Philips and penetrated to within a few hundred yards of Scimitar Hill. Opened fire on enemy about 200 yards from Turkish front line. Later ordered to withdraw to 159th Brigade lines. Further attempts to take enemy positions during afternoon also failed. All reports of 158th Brigade's advance refer to lack of maps and confusion. Casualties - Lieutenant-Colonel B. E Philips, Lieutenant H. O Williams, Second-Lieutenants R. C. Walton, J. H. F. Leland, F. P. Synnott, R. M. Mocatta and 13 Other Ranks killed, 6 Officers, 116 Other Ranks wounded: 39 missing. 1915 Dec 11. Evacuated from Gallpoli and moved to Egypt. 1915 Dec 17. 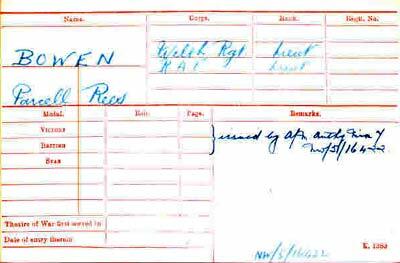 Welsh Regt.—The following Officers revert to the rank of 2nd Lt. on alteration in posting, 2nd Lt. (temp. Lt.) P. R. Bowen. 1917 Aug 16. 2nd Lt. Parcell Rees Bowen, Welsh R., attd. M.G. Corps. MC Citation. For conspicuous gallantry and devotion toduty. He displayed great gallantry and skill in handling his guns under very trying conditions, and behaving with great resource and initiative in outflanking a house used as divisional headquarters and compelling the inmates to surrender. 1917 Apr 25. Welsh Regt. 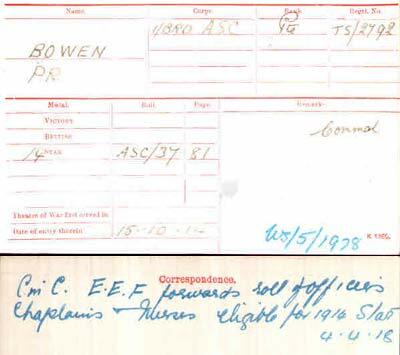 2nd Lt. P. R. Bowen, M.C., to be Lt., with precedence as from 25th Apr. 1917. 1917 Nov 10 Lt Flying Officer, Observer with seniority from this date. 1918 Jan 10. Parcell Bowen then transferred into the Royal Air Force, becoming an Observer. 1918 Sep 22. He gained his decoration of the Distinguished Flying Cross during the air war in Egypt. 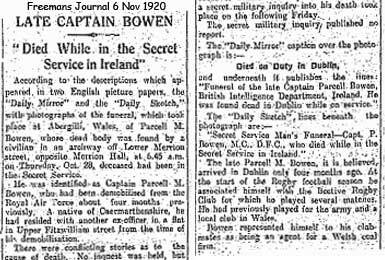 Lt. Parcell Rees Bowen, M.C.,.2nd Lieut. Robert Fawcett. DFC citation. These officers have displayed marked courage and determination on many occasions. On 22nd September they carried out an excellent reconnaissance under difficult conditions, the clouds being very low over the hills, bringing back most valuable information. He appears from his record to have been in 14 Squadron which flew RE8s and supported the Army advance through Palestine and onwards towards Damascus up until the Turkish Armistice which was signed at the end of October 1918. Following the successful conclusion of the Palestine campaign, 14 Squadron returned to Egypt and prepared to embark for Salonika, but the War ended with the Armistice of 11th November 1918 and, instead, the unit returned to the UK where it was reduced to a cadre. 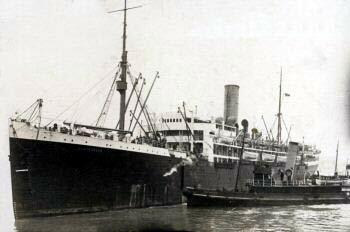 1919 Jan 13, arrives back in England, having left Middle East on 27 Dec 1918. 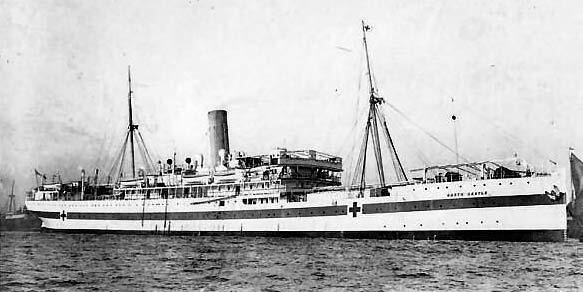 1919 Jan 23 enters Tooting Hospital - VD. His symptoms are "general adenitis. roscolar rash. SP present" "no open lesions" Caught it apparently in Palestine. And was being treated at Grove Military Hospital Tooting. Before penicillen became asvailable for the treatment of VD, thee treatemnt was fairly basic. A combined arsenic and mercury treatment (intensive treatment) introduced by Neisser was most recommended for general adoption. 1919 Feb 10. Medical board on his VD concludes that he need 3 months before he can return to duty. It states that he picked up he VD in Palestine on 20 Oct 1918 and that it was due entirely to his own misconduct. 1919 Apr 30. He was then placed on unemployed list. 1919 May 24 Posted to 31 Training Squadron which was based at Wyton, and is described as being a mobilization station. This would suggest that he was mobilized there prior to being sent to Russia. 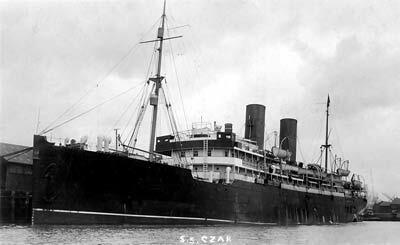 1919 Jul 3 He embarked for Archangel on the HMT Czar. He served with No 3 Squadron, Slavo-British Aviation Corps, at Bereznik as an Observer (Elope Command). The Slavo-British Aviation Corps was a mixture of British and Russian personnel fighting for the White Russians. The British formed Slavo-British regiments and also the Aviation Corps from Russian personnel with British officers and NCOs to maintain the fight against the Bolsheviks. This was ostensibly to safeguard a very large quantity of military stores which the British had shipped to Russia which were lying at Murmansk and Archangel. Churchill, who was Minister for War & Air, had sent a North Russian Relief Force in the spring of 1919 to enable the evacuation of British forces which had been sent in 1918. British hoped that after their withdrawal the Slavo-British units would continue under Russian officers. They seem in fact to have quite quickly collapsed when the British pulled out in autumn 1919. 1919 Jul 16. When Parcell Bowen arrived at Archangel, he met his old friend from Carmarthen, Ira Jones. In Ira Jones's book, 'An Airfighter's Scrapbook', Ira about Parcell Bowen's arrival in his Squadron. Lt. Ira Jones flew with Maj. Geoffrey Bowman's No. 3 Squadron at Bereznik on the Dvina front. Ira Jones is known to have flown a DH-9A on his first combat mission of the war, sinking one boat and heavily damaging another in a devastating attack on a 'Bolo Flotilla' at Puchega. Other Red Air Units are similarly neutralized by preemptive attacks on their aerodromes. Puchega was bombed at least twice by Allied aircraft. (Avro 504s and DH9s) from Bereznik. Operations subsequently confined to bombing and recce missions, as Red aircraft become scarce in the north at this time. The village of Gorodok was heavily bombed by No. 3 squadron. No 1 squadron. Major Kozakov's No. 1 are equipped with the latest Sopwith fighters, DH9s & 9As, a few Avro 504Ks and at least one Nieuport of indeterminate type, probably a 17C-1. August 1st, 1919, Kazakov's Camel broke up in mid-air at 300ft above Bereznik aerodrome and the gallant Russian was killed instantly. No 2 squadron under Major Charles R. Carr. A New Zealander. For most of W.W.II he was Commander of No.4 Group, Bomber Command and went on to become Air Marshall Sir Charles Roderick Carr, K.B.E., C.B., D.F.C., A.F.C.., retiring in 1947. 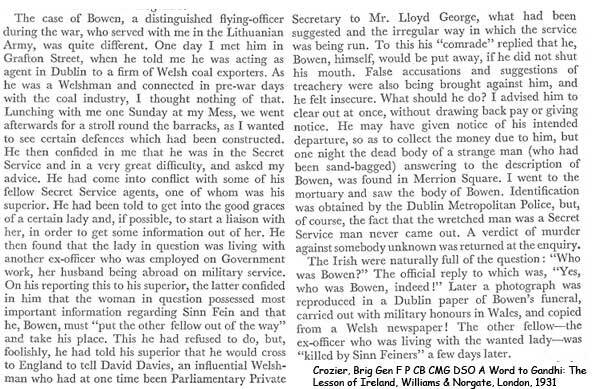 1919 Aug 24 Observer-Officer PARCELL REES BOWEN, M.C., D.F.C. (5th Welsh Rifles). On August 24, 1919, whilst observer on reconnaissance over the enemy aerodrome (Toima), he was fired upon at long distance range from an enemy machine, both himself and the pilot being wounded. The pilot having collapsed from his wound on to the controls, Observer-Officer Bowen managed to guide the machine from the back seat and flew homeward for a distance of 100 miles, by which time the pilot had slightly recovered and took control of the landing, which was safely made on the Bereznik Aerodrome. This officer's action was highly meritorious, and the guiding of the machine over a long distance was especially noteworthy in view of the wound which he had sustained in the right elbow. 1919 Oct 28 Parcell Rees Bowen served in Lithuania 28/10/19 - 1/3/20 from Lithuanian Army Order No 303 dated 15/4/20, which lists all the officers who served with Crozier. These are there same dates as those for Carr. Major Charles Roderick Carr, who had commanded no2 squadron when Bowen was flying in no3 squadron in Bereznik, Russia earlier in the year was the commander of the Lithuanian Air Force. According to a history of the Lithuanian Airforce published by Blue Rider, Carr and the other pilots were hired through the good offices of a British Military mission. 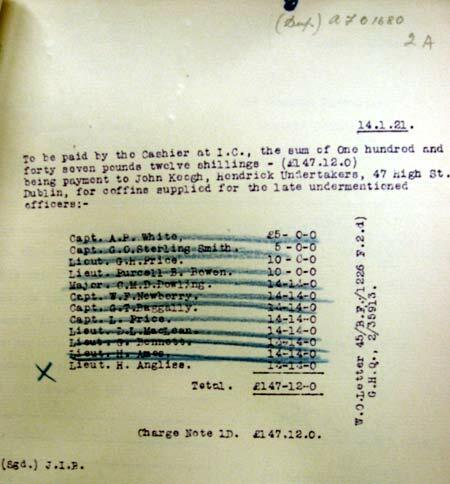 Carr and 3 other RAF officers appear to have been hired in response to the diplomatic row in early October and it would seem that the organisation of this would seen to have been arranged in Lithuania (probably by Pranas Hiksa who had taken over the flying school in April 1919) whilst Crozier was still in Paris with the Lithuanian mission. Hiksa had flown with the RFC and RAF. On 16th December 1919 the first 34 Lithuanian Flying Officers passed out of the Flying school relieving the pressure for the use of foreign pilots and observers. A despatch from Lt Col RF B Ward, Assistant Commissioner, British Commission for the Baltic Provinces to Lord Curzon ( then Foreign Secretary) dated 12/2/20. When discussing the difficulties Crozier is having with the Lithuanians he states: 'In addition to General Crozier's officers, there still remain four British officers for organisation of the Lithuanian Aviation Corps, who are on a separate contract altogether.' This comes from D Cameron Watt ed British Documents on Foreign Affairs Confidential Print Part II Series A Vol 2 p140 (University Publications of America, 1984). Thomas Girdwood MacFie, a South African infantryman, who won an MC on the Western Front and the DSO in North Russia. Not in RAF, but certainly, according to Crozier, with Carr in the Lithuanian Air Force. But is not on the Lituanian list of officers in their Air Force. 1920 Jul. 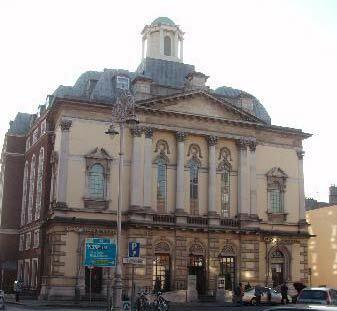 He accepted a secret Government Post which involved him going undercover in Dublin. 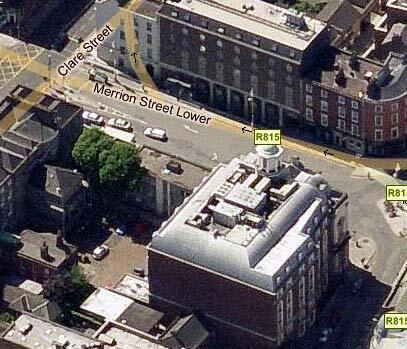 He had been living at 28 Fitzwilliam St Upper and both Thom's 1914 and Thom's 1927 shows is was owned by Mrs. Caroline Thiery. Caroline Thiery, Irish, widow and Maternity nurse and lodging house keeper at least from 1901- 1927, as one can trace her through censuses and directories. The dead husband, Alexander was from Dorset and was a Commission Agent. One of the 1901 lodgers was a British Military Captain. And in 1911 her lodgers were "professional men". She had one daughter who was a teenager in 1920, who could have grandchildren alive. I tracked down a living descendent on GenesReunited and am trying to see if they have anything on Caroline Thiery and her lodging houses, but got no reply. He is commemorated at Abergwili War Memorial which just to the east of Carmarthen. He was buried in Abergwili Churchyard. 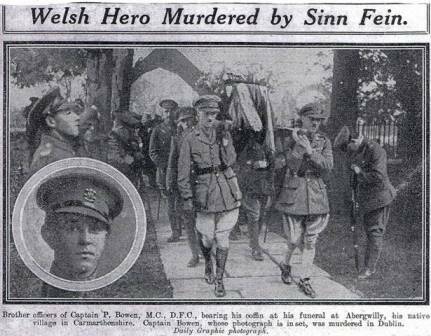 His probate entry reads - Bowen Parcell Rees of Pantyglien Abergwili Carmarthenshire, a captain in His Majesty's Royal Air Forces died 27 October 1920 at Dublin. Administration Carmarthen 22 December to Josiah Bowen farmer. Effects £87 2s. 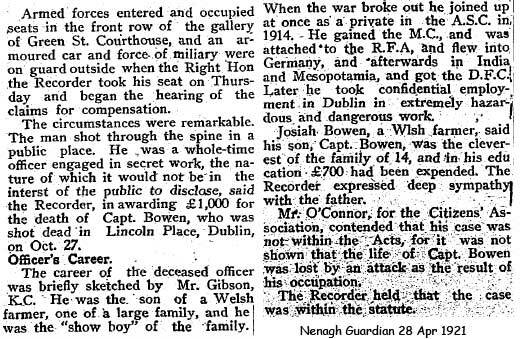 He is included in "Soldier's Effects" adding further evidence that he was a serving soldier at the time of his death. His father Bowen, Josiah of Pantyglien Abergwili Carmarthenshire died 19th September 1928. 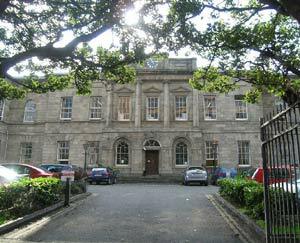 Probate Carmarthen 31 October to Mary Bowen widow and John Samuel Rees and Rees Pugh Jones farmers. Effects £3618 8s 3d. 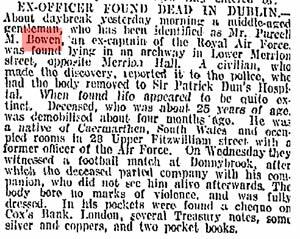 1931 A book written by Crozier, casts new light on the subject of Bowen's death. Crozier speculates that Bowen was shot by the British.